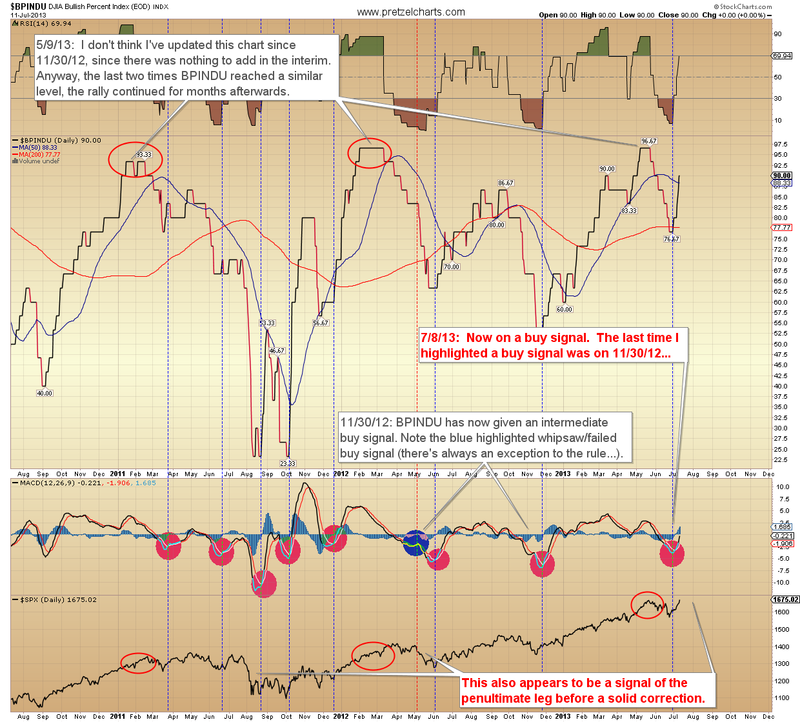 Pretzel Logic's Market Charts and Analysis: Is There Any Hope Left for Bears? Is There Any Hope Left for Bears? I've written before that fourth waves are my arch-nemesis. As a trader, I largely avoid trading them unless I have a clear read. As an analyst, I don't have the luxury of ignoring a market -- all I can do is what I've been doing for the past few weeks: warn that the wave structure was unclear to me, and that, while I was leaning very slightly bearish, it was entirely possible that wave iv had bottomed at 1560. It now appears that was indeed the case; but I would still caution that fourth waves are known for their complexity, and the obvious answer isn't always the right one. I'll discuss one such option shortly. 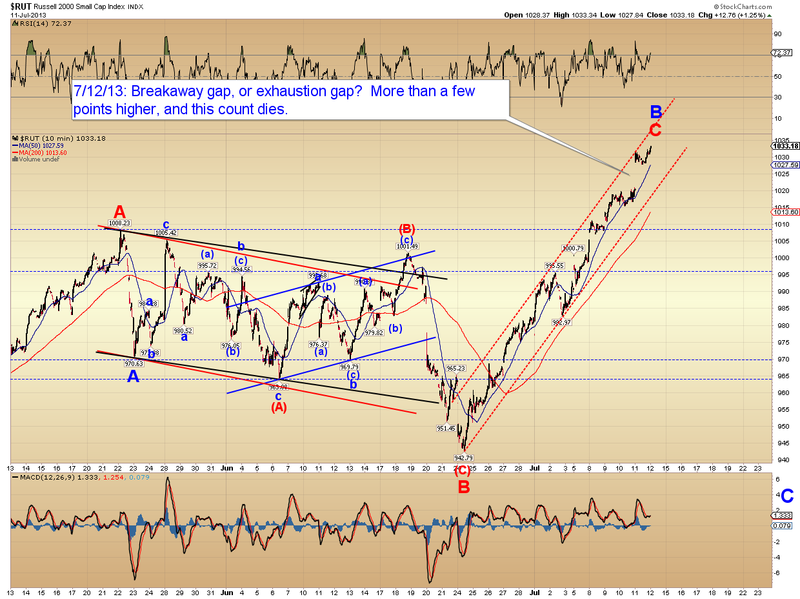 In any case, if you want to place blame for missing the exact bottom, then don't blame Elliott Wave Theory: blame me. Wave theory had this one pegged; and had I simply stuck with my original anticipatory read of the pattern from months ago, and then more recently favored my hypothesis of an (albeit messy) ABC pattern off the high, then I would not have waffled around thinking there may be another wave down still to come -- however, at least those potentials did keep me from turning overly bearish. In fact, once the bulls held 1608, for the near-term at least, I began anticipating that SPX was headed toward the 1640-50's. In conclusion, we're in something of a no-man's land at the moment. The market has so far failed to reach my target zone, and has held the key 1560 support zone that I mentioned in Monday's update. For the moment, have to at least consider the potential that the bottom is in. If you're of a bearish inclination, I would suggest only low risk entries until we have confirmation of an impulsive move downward (which would indicate the larger trend has changed). For that to happen, the market needs a new low -- as of right now, the long-term trend is still currently pointed upwards, and both options remain viable. Sometimes the market makes perfect sense; sometimes it doesn't. We don't need to know what the market will do every minute of every day; we only need to have a pretty good idea what it will do often enough to make money. And then -- and I think this is a key aspect that many novice traders miss -- we need to maintain the discipline not to act (and preserve capital) when things are vague; at such times, I try to limit my trades to low-risk/high-reward propositions, which I've also been urging for the last few weeks. 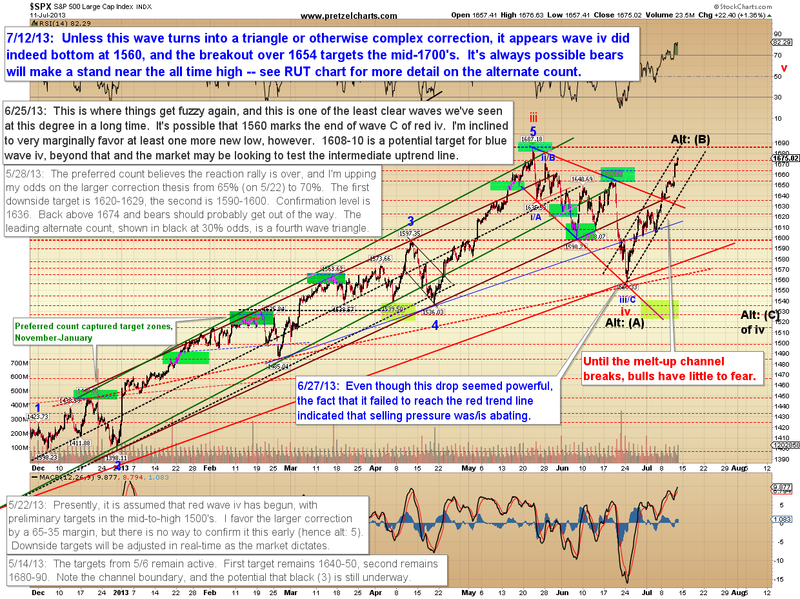 As an aside, the recent move in equities calls to mind a thought I've discussed previously. I can illustrate it with a bit of personal experience: One vehicle I've really grown to love trading is the US Dollar/Japanese Yen Forex pair. One of the reasons I love it is because I have absolutely zero fundamental bias about where it "should" be, price-wise. This lets me look at the charts completely fresh each day, with no fear or hope as to what I think it should be doing, or where I think it should be priced. As a result of being able to view each pattern with complete objectivity, my win percentage there (outside of being burned on a few massive intraday gaps where my orders get filled miles away from my actual stop price -- you Forex traders know exactly what I'm talking about) is phenomenal. The point being, if we can remove our fundamental bias and trade only what we see, it helps our performance immensely. Most of us have a hard time doing that with equities, because we all have an opinion on whether they "should be" priced higher or lower than they are. As much as I can, I try to look at equities without bias -- but I am, after all, half-human, so I'm unable to completely remove all bias and emotion. In any case, all that is now "spilled milk under the bridge," as they say -- so let's get up to speed on the present. As I've noted over the past couple weeks, most indicators have been in the process of rolling bullish, and most have now done so. This suggests a straightforward fifth wave rally underway, but in the interest of seeing both sides of the trade, I'll also discuss one bearish option afterwards. First up is the chart of the Dow Jones Bullish Percent Index. I noted on July 8 that this had flipped to a buy signal, and that signal remains active. Next is the S&P 500 (SPX). While a bearish alternate count is noted, we should probably assume the more straightforward wave iv and v count until proved otherwise. The Nasdaq Composite has nearly reached the target from its recent breakout, and SPX is approaching the all-time high. It's not unreasonable to expect some form of correction soon, assuming the market ever decides to correct again. 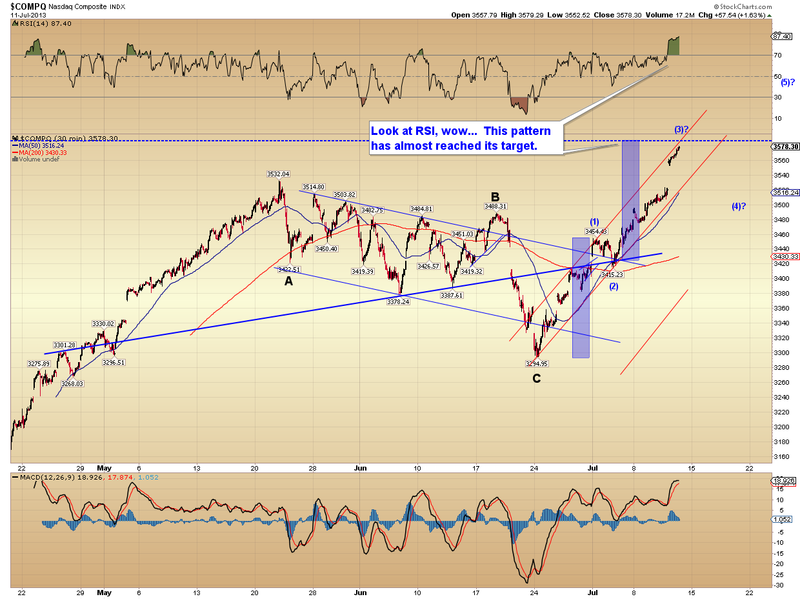 The bearish potential is detailed on the Russell 2000 (RUT) chart below. 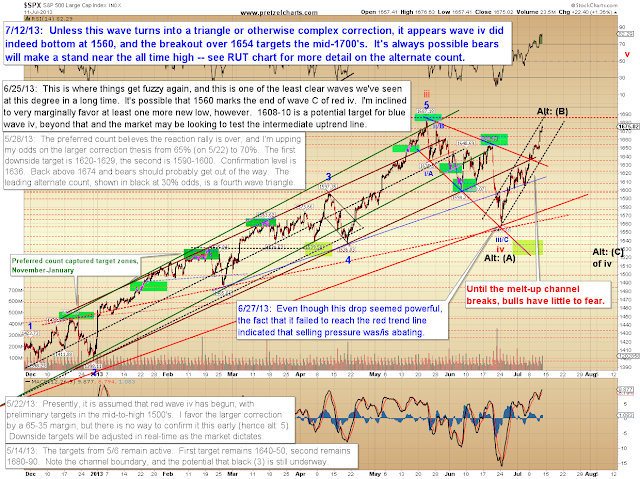 For this to remain viable, the market cannot move more than a few points higher from here. 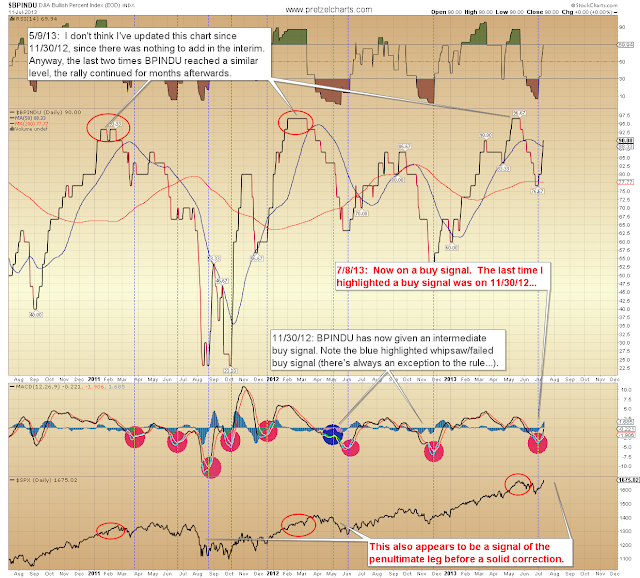 Speaking of low risk/high reward potentials, the market has reached one of those inflection points. In conclusion, while a correction would not be out of the question, with most indicators now on bullish buy signals, we should probably assume that the next dip will be bought. We'll also keep an eye on the alternate intermediate bearish potential, but for that to have any hope, a solid correction would need to begin directly. Trade safe. Hi, one market you don't mention is BKX, and this one seems to have completed its 5 waves up. 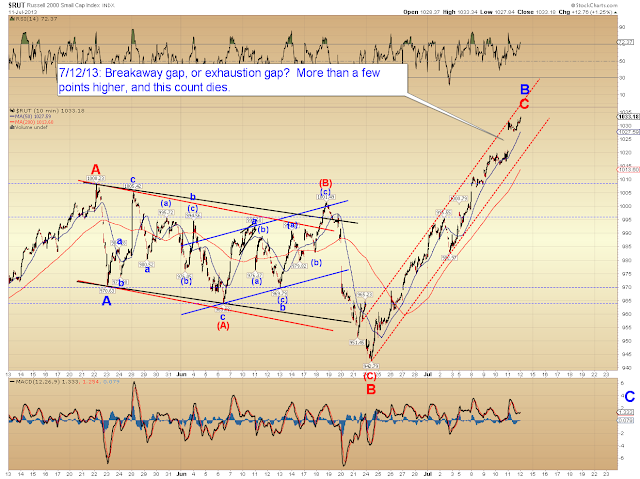 Also, for an extended 3, wave 5 could go anywhere from (net 3-1)*0.382, to = wave 1 to = wave 1*1.62 to = wave 1*2.62. First target is 1691.68 and we are almost there, then a 1.62*wave 1 = 1708.95, also a stone's throw. Nasdaq seem to have completed its wave up. I agree that there is a missing minor 4 pull-back then last push higher. But however you count, I certainly don't agree that this is no hope for bears, on the contrary, we are for sure completing the 5 wave up from Nov 2012, and a correction of min. 38.2% will follow. 1800 is the absolute high mark for this wave but seem very over-stretched for an extended 3. Other targets could be 1738.64, 1752.11 and 1761.98. I guess I felt that I was trying to convey that this would be a good spot for a correction and a reasonable risk/reward entry for bears -- at least for an ST/IT trade. Take it that's not what you got from it, lol.